A celebration of citizen science is to take place in Inverness next week after a record number of stranded marine animals were reported over the past year around Scotland’s coasts. 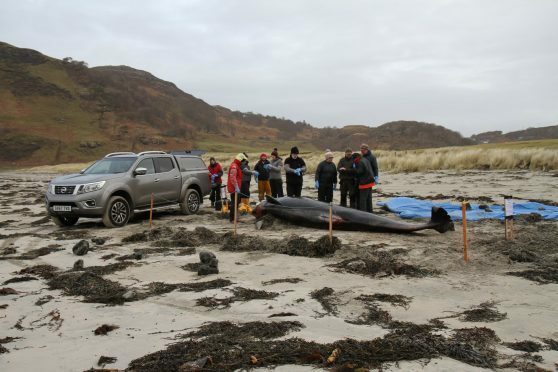 The Marine Forum event, organised by the Scottish Marine Animal Stranding Scheme (SMASS) and Whale and Dolphin Conservation (WDC), is to analyse some of the strandings which took place in 2018, acknowledging the crucial contribution of the public to understanding the life in Scotland’s waters. Workshops and presentations are to take place, with a number of highly informative speakers set to grace the event. In total, 930 strandings were reported in 2018. Dr Andrew Brownlow, manager of SMASS and who will be speaking at the event, said: “Both the SMASS and the WDC Shorewatch initiatives rely on help from members of the public, and in particular our networks of trained volunteers. WDC chief executive Chris Butler-Stroud said: “The problems faced by whales and dolphins around the world are no longer subject to simple solutions. The event is set to take place at the UHI Centre for Health Science in Inverness on Saturday, March 2, at 9.30am.